Separation of property marriage, community of property marriage. Agreement regarding child custody in case of future divorce or separation. We specialize in both divorce and pre-marriage agreement also called Marriage-Covenants. A well done, clear pre-marriage agreement (See our article clicking the link "divorce") will avoid many future troubles in case of divorce or family litigations. 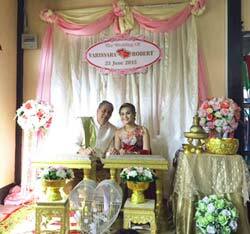 We strongly suggest you to consult our lawyers in Pattaya before registring a marriage. A marriage is in fact a special kind of contract which needs special attention. Our lawyers will be glad to provide any kind of advice and legal consultancy. Remember that even though, in case of agreement (consensual divorce), divorcing in Thailand can be very easy, on the other side, in case of disagreement it can become a real Odissey and even be denied. As we have often underlined, the most fascinating aspect of living in Thailand consists possibly in the, sometimes, so profound differences between the Thai and the Western cultures. In most of the western countries for instance, in the very recent past, it was custom for the wife to bring a dowry, a sort of gift, a contribution to the future life of the new couple. In Thailand rather than the Dowry, (money or assets transferred from the bride's family to the groom or to his family), we have the related concept of the bride price. While the bride price is a payment made by the groom or his family to the bride's parents, the dowry is the wealth transferred from the bride's family to the groom or to his family. The price of the bride is not simply a sort of compensation due to the family of the bride for their "loss", but has a far deeper significance: it is an act of respect, a sort of guarantee and, let me say it, even a demonstration of love which extends from the bride to her family. The price of the bride or better the "Kah Sinsod", is a tradition very often misunderstood by foreigners living in Thailand who confuse a tradition so deeply-rooted in the culture of the Country with a sort of commercialization of the bride, if not an attempt to exploit the foreign groom. Nothing could be further from the truth: first of all, anybody is, still nowadays, obliged to pay the Kah Sin Sood, especially in the rural Thailand; secondly, the price of the bride is not at all a commercialization of the marriage, but is rather an act of appreciation for the bride and of her family. An ancient Thai proverb recites: “a stingy price (of the bride) brings a meager wife”. I have personally met many foreigners married to Thai women proudly bragging to have not paid any price for their wives (a very bad start for a marriage in Thailand!) when, where in their books, a Thai man would feel so humiliated to not having been able to give a "better price". I have also personally met many Thais so desperate to have the sufficient funds for the Kah Sinsod that they really "moved" me! (Section 1437 Civil and Commercial Code) Sinsod is property given by the man to the parents, adopter or guardian of the woman, as the case may be, in return for the woman agreeing to marry. If the marriage does not take place due mainly on the part of the woman or on account of any circumstances that make the woman responsible and make the marriage unsuitable for the man or make the man unable to marry that woman, the man may claim the return of the Sinsod....voila! But make no mistake, the Kah Sinsod shall not be confused with the Betrothal (promise of marriage) where the extent of the law goes much further. As we can read in article 1438, Betrothal shall not be the cause to request the court to compel the marriage... where... agreement to pay a penalty in case of breach of the betrothal agreement shall be void ...but... (Article 1439) after a betrothal has taken place, if either party commits a breach of the betrothal agreement, the guilty party shall be liable to make compensation. In cases where a woman commits a breach of the betrothal agreement, the betrothal gift shall also be returned to the man. Compensation may be claimed for the following causes: for injurycaused to the body or reputation of the man or woman; for appropriate expenses or debt incurred in good faith by the betrothed, his or her parents or a person acting in the capacity of his or her parents inpreparation for the marriage; for damages suered by the man orwoman through having take appropriate measures aecting his or herproperty or other aairs relating to his or her occupation or earningsin expectation of the marriage.Furthermore, please read carefully the sections 1443 and 1444: Incases where there is a significant event that happens to the betrothed woman making the marriage unsuitable for the man, the man shall be entitled to terminate the betrothal agreement and the woman shallreturn the betrothal gift to the man. On the other hand, in cases wherea significant event happens to the betrothed man making the marriage unsuitable for the woman, the woman shall be entitled to terminate the betrothal agreement and the betrothal gift does not need to be returned to the man! Finally, according to Section 1444: If the grounds that makes the one betrothed to renounce the betrothal agreement is gross misconduct committed by the other betrothed, the betrothed who had committed the gross misconduct shall be liable to make compensation to the other party who has exercised his/her right to terminate the betrothal agreement as if he/she has breached the agreement. Finally.... I can't conclude this article without quoting the answer by a friend of mine who had just married when I asked him how he found the marriage... "You know what? I am so happy that if I would have known before, I would have never been betrothed... I would rather have directly married her!" If it is true that the proverbs often contain the quintessence of the popular wisdom matured through centuries of real life experience, never a proverb has been more appropriate as our in case of marriage in Thailand, especially if the spouses come, as often happens here, from distant, different cultures. In theory in Thailand, registering a marriage or dissolving it can be extremely easy. In fact to marry your sweetheart, provided that you are single, it will be enough to show proof of celibacy and a few more routinedocuments. Similarly, in case of complete agreement, to divorce is even easier, even if the marriage has produced offspring. If the spouses are in full agreement, it suffices to go back to the municipality and subscribe a document of divorce in front of two witnesses. Et...voilà...! Les jeux sont fait! ...but ...really? Is it really so easy? How many people do you know who, after years of marriage, actually divorce without any conflicts, demands or contrasts? As we all know a marriage is a private contract though partly regulated by law. In most western countries, at the moment of the subscription of the contract, we are in front of a choice: choose the "regime" of community or the one of separation of property. In the first case, all goods that you will buy before the marriage will remain yours, in the second case all assets purchased after the marriage will be common property. In Thailand the spouses, at the moment of the registration of the marriage can, in the same way, register an agreement choosing the "sin som rot" (community) or "sin suan tua" (separation) with the difference that such a choice is much wider then in the West and it can go much further then a simple choice of community or separation of property. Provided that such a pact respects the law, it can be enforced by a court in case one of the spouses should fail to respect it and it will make a solid ground to avoid future conflicts. Despite that globalization is quickly flattening differences and sadly canceling many of the local traditions that used to make the world so various, in Thailand the "Kah Sin Sot", a dowry "upside down", is still deeply-rooted and respected. The groom must pay a dowry to the family of the bride and, even though such a habit doesn't officially entail legal consequences, it still has a great influence on the "way of seeing" the marriage in its whole significance. In a Thai marriage the "Kah Sin Sot" can not be included in the "Sin Som Rot" (the common goods) and belongs to the parents of the bride. On the contrary the spouses can derogate to the regime of "common property" partly or totally, for example indicating one or more particular property that one of the spouses intendsto buy or specifying that anything purchased after the marriage will remain of exclusive property of the purchaser. But the possibilities offered by the pre-marital agreements are not limited to material goods, they can also foreseemany other aspects of a future separation including the custody of children . Unfortunately the majority of foreigners marrying Thai nationals, so used to the western strict limits and rules, ignore the wide discretion admitted by the Thai legal system and rarely subscribe and register a properly set up, clear pre-marital covenant which in most cases would avoid never-ending conflicts, litigations and stress. Remember, without a pre-marital agreement all the assets acquired after the marriage will be common property of the spouses in the measure of 50% each (including your brand new beloved car, bike or boat!!) with very few exemptions as donations, gifts and strictly personal goods. The spouse can't consequently dispose of more then 50% of the common assets by last will so think well and remember....Clear agreements make for long friendship...in our case we may say...for long marriage!